The Organisers reserve the right to limit and refuse entries. The Organisers reserve the right to amend the Race rules without prior notification. The Organisers reserve the right to amend the race course and venue without prior notice to participants. On-site reporting and body marking will start one hour before the commencement of the race. Participants have to place their bicycles and gear at their designated location in the transition area. Participants in the relay categories are responsible for passing the timing chip to their teammates at the designated areas after their respective legs. Prior to race day, in the event of inclement weather, force majeure or other hazardous conditions, the Organisers reserve the right to reschedule or cancel the race without any refund of registration fees. On race day, in the event of inclement weather, force majeure or other hazardous conditions, the Organisers reserve the right to delay the commencement of the race, shorten the race or modify the course. The bike and run disciplines may have time limitations. Participants that do not make the time limit will be removed from the course. Participants shall be aware that while all possible care will be taken by the event organizer to safeguard the bag deposit items, the event organiser shall not be held liable in the unlikely event of missing or damaged items. Participants are advised to avoid depositing valuable or fragile items while using the bag deposit service. Participants that do not return their timing device within 7 days after the event date will be charged S$40 or S$10 if only the strap is missing. On-the-spot entries will not be accepted. Relay Teams may consist of 2 or 3 members. Star Games teams must consist of 3 team members. Participants must be 18 years old on 31 December 2018 to compete in the City60 (individual and relay). Participants must be 16 years old on 31 December 2018 to compete in the City30 (individual and relay). Participants must be 12 years old on 31 December 2018 to compete in the City15. Participants must be 8 years old on 31 December 2018 to compete in the City6 (7 years for relay participants). Age category is determined by the participant’s age on 31 December 2018. Changes to team relay members are permitted until registration closing date. An admin fee of S$20 will apply per change of person. Upgrade or downgrade of a race entry is permitted until registration closing date. An admin fee of S$20 will apply per change. All changes must be made two weeks before race day. Cyclists must ensure that their competition numbers are clearly visible at the back of their adorned apparel at all times. No bare torso is allowed at all times. A participant may run or walk with his bicycle. Cyclists are to keep to the left side of the road and reminded to observe traffic rules at all times. All participants will be required to perform their own repairs if their bicycles should break down. All cyclists must wear helmets with straps secured from the time they remove their bicycle from the rack. The helmet must stay secured on the cyclist’s head until he/she has placed his/her bicycle at the allocated spot on the bicycle rack. It is the participants’ responsibility to ensure that their bicycles and bicycle brakes are in good working condition. Wearing headphones is not allowed at any time. 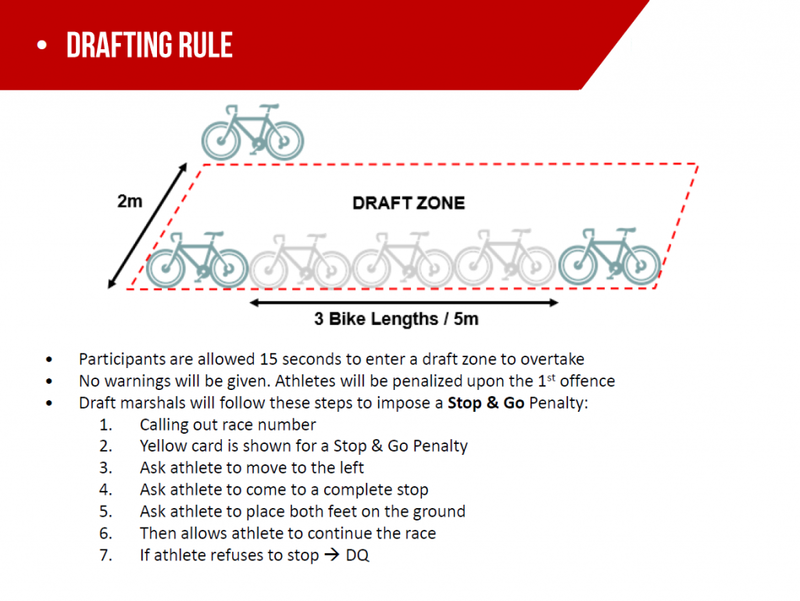 Drafting is not allowed. If caught, cyclists will receive a Stop-and-Go penalty. Riding side-by-side is called “blocking” and is an offence with corresponding penalty. Runners must wear their race number clearly visible at the front of their adorned apparel at all times. Runners must run on the designated path for the entire route.